Russia’s deputy prime minister Dmitry Rogozin faces a formidable challenge of modernising Russia’s military-industrial complex. He should not be deterred in this vital national mission by alarmists and doubters, says Aleksey Volodin. Dmitry Rogozin, Russia’s deputy prime minister in charge of defence, can’t stay away from the spotlight. Perhaps no one among the current ministers of the Russian government has attracted as much attention as Rogozin. This is partly because Rogozin, in contrast to many other federal ministers, is relatively new to power, and great expectations have been placed on his shoulders. Not surprisingly, he is often the target of criticism. By and large it’s possible to offer quite a bit of criticism, but it is impossible to deny the fact that to resolve such a thorny issue as the modernisation of the Russian army and the formation of a developmental vector for the Russian military industrial sector in several months is, as one well-known historical figure said, very important and very daunting at the same time. Rowing against the tide: such an analogy comes to mind when it comes to Dmitry Rogozin's work as Deputy Prime Minister. But let's not delve into intricacies and government intrigue; we should consider the question of what kind of problems the industry faces and, therefore, directly confront Rogozin himself. In a recent interview with Kommersant, the Russian deputy prime minister said that the strategy for the development of the military-technical field will consist of two main areas: the development of Russia's own production capacity and the creation of joint ventures for the production of military equipment; such ventures will be planned for the use of foreign technologies, and not just simply for screwdriver assembly. He also mentioned that Russia would not procure large amounts of foreign military equipment. This means that such a substantial project as Mistral involving the procurement of military equipment of foreign manufacture can actually be both first and last in priority. In connection with this, it is important to build up our own production capacity. However, a serious obstacle prevents the realisation of this type of project. Rogozin himself mentioned this. It is often easier to build a new factory for the production of a particular technology for military purposes than to modernize the old equipment on production lines that are in need of repair. And it is this state of affairs that needs to be addressed urgently in Russia. Sadly, People have already forgotten how to trust the authorities, so the initiative for constructing new production facilities and equipping them with new equipment raises a number of complaints. These complaints relate to suspicions of corruption in certain army reform processes and the modernisation of the military industrial sector. They question why you should build when you can patch up the old ... But do not think that Rogozin's initiatives are waiting to be foiled by corruption and bureaucratic red tape at every turn. Otherwise, you will join the ranks of full-time alarmists that consider any mission by default to be impossible. What Rogozin talks about is quite promising and feasible. 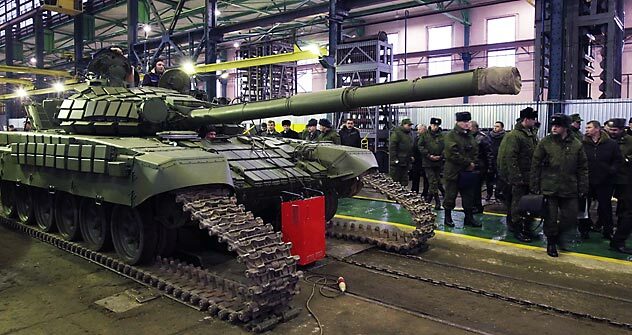 The creation of new industrial enterprises using funds allocated from the state budget can work like a locomotive not only to spur the development of the military industrial sector, but also help bolster Russian industry, and hence the economy. After all, we must not forget that a programme is active in our country to create several million new jobs within the next few years. The concept for building new factories fits best within the overall system for creating new jobs. If we talk about joint Russian-foreign partnerships, then this also has its positive aspects. Besides the obvious advantages associated with an increase in bilateral trade, joint partnerships also promise to foster the exchange of best practices. And here do not think that Russia will fall into a kind of dependence on foreign partners. It is necessary to ensure the functioning of a sound legal framework within these joint ventures that will regulate the exchange of technologies and joint-financing projects. Of course, creating a balanced legal framework for this activity is sometimes much harder than carrying out a direct partnership, but the legal environment should ensure the compliance of all parties with financial commitments as well as intellectual property rights. Here we must pay attention to the fact that Russia is already involved in many joint projects: for example, the creation of BrahMos Russian-Indian missiles. This anti-ship missile is created by integrating the capabilities of the Russian MIC NPO Mashinostroyenia and the Indian DRDO on the basis of the Russian Yakhont. The project for creating and delivering 200 BrahMos missiles to India cost about $4 billion. You could imagine what financial opportunities could be uncovered if there were many more such joint ventures. Based on the results of 2011, Russia became 6th in the world in terms of defence spending overtaking Germany. This suggests that Russia's prospects of cooperating with other countries interested in modernising their own armies are manifold. If financial resources, the state budget permitting, could be used today, then it is possible to say that tomorrow Russia can expect not only a substantive modernisation of its military industrial sector, but also substantial progress for the entire economy.